Discount of 20% off 3 or more. See our order information page. (2016), 304-page paperback, $29.95 SALE! $20. 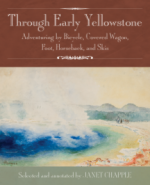 Adventure travel accounts from 1871 to 1916, selected by Yellowstone Treasures author Janet Chapple, with 19th-century art she unearthed and maps both historic and modern. 2016 Foreword INDIES Book of the Year Award Honorable Mention in Travel. Updated fifth edition (2017). 400-page paperback, $24.95. 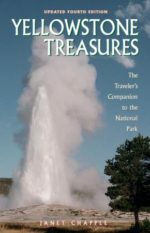 This comprehensive guidebook provides mile-by-mile road logs, geyser walks, out-of-the-way hikes, and a field guide to plants and animals. Many travel tips, 200+ photos, 37 maps. 2017 IBPA Benjamin Franklin Silver Award in Travel. 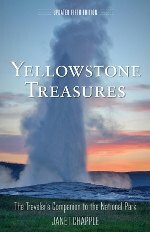 Also available as an e-book in ePub, Kindle, and PDF formats. Updated fourth edition (2013), reprinted 2015. 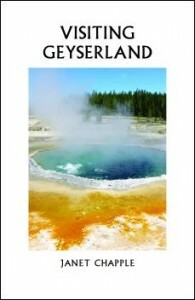 This comprehensive guidebook provides mile-by-mile road logs, geyser walks, out-of-the-way hikes, and a field guide to plants and animals. Many travel tips, 200+ photos, 37 maps. Buy in ePub, PDF, and FREE on Kindle Unlimited. 2013, 286 pages. $29.95. Available in hard cover and Kindle. 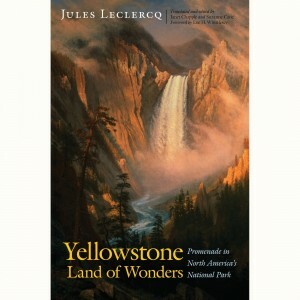 Published by University of Nebraska Press.